My Kindle on the left, Holly's Nook on the right. The Kindle and the Nook were both a little smaller than I expected. They each fit in cases nicely, and though the Nook is slightly heavier and thicker than my Kindle (which I named Berta, by the way), each are a good, comfortable size, and they don't seem bulky with their cases. As far as displays go, the Nook's is fancier. It's in color, it has a touch screen, a pretty background, and you can arrange your books, magazines, etc., and drag them. I was pretty wowed by it. Berta is less flashy, with a main page list and the ability to create groupings (you can click on the picture to enlarge it and see), so I've sorted my books by YA, Adult, ARCs, etc. You can't view them by book cover like you can with the Nook, which I really liked. 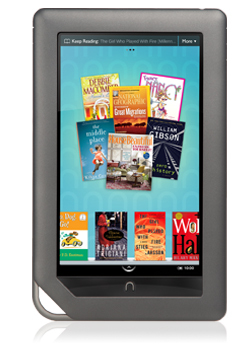 It is super easy to find your way around the Nook with the touch screen, which I enjoyed. The Kindle has the square-ish navigation button on the bottom right that allows you move around through the menus and the actual content of the book. There are instructions and tips for easily highlighting passages and such, but it is easier to do on the Nook. As far as when reading, the Nook has page numbers while the Kindle only has a status bar and tells you your progress in percentages. At first this really irked me because I was worried about keeping up on my Kindle in Literature classes, but after reading about six books on Berta, I have found it really doesn't bother me as much as I thought it would--in fact, I read faster without being preoccupied with what page I'm on. So, as far as I am concerned, this is just a matter of taste. Flipping the pages was also a concern for me. I like the flip speed of the buttons on either side of the Kindle (so whichever hand you're holding it in, you can flip back and forth). With the Nook, you touch the screen to flip the page...so, if you want to go back, you touch the left side of the screen, and you touch the right to go forward. My only worry is that I would always be accidentally touching the screen and losing my place...but, Holly said it hasn't been an issue for her yet. 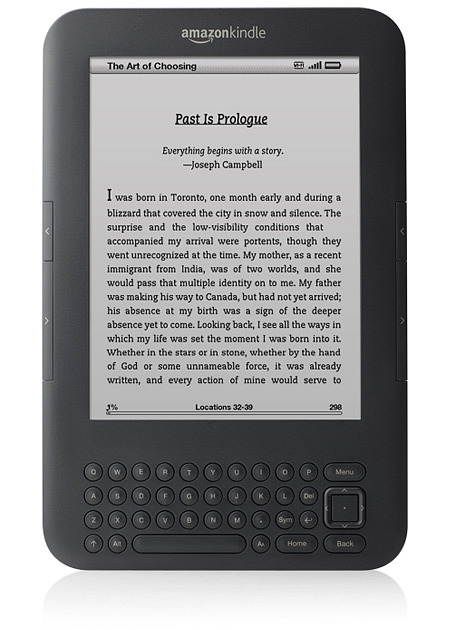 Both the Kindle and the Nook automatically save your place in a book whenever you leave it, and have easily accessible features that allow you to go to any part of the book at any time. However, a feature that the Nook had I wish was available in the Kindle is a button on the bottom navbar that allows you to return to the book you were last reading. On the Kindle, you have to go to the book and select it if you want to return. Kindle comes in two versions, 3G + Wi-Fi , and just Wi-Fi . The Wi-Fi allows you to access the Kindle store and the web browser. The 3G allows you to access it when you aren't in a hot spot, and it works globally. The difference in price between the two is $50, which I don't think is so bad in the long run...hence, I have the 3G version. It's serviced by AT&T, and it seems to have pretty good coverage for my area compared to my Blackberry, which I have through Verizon. Holly's Nook only has Wi-Fi, which isn't such a deal breaker, and it actually has a nicer web browser. She was accessing Facebook and her email with great ease, and with the color display, it looked really nice. I can do the same from my Kindle, but because of the black and white display, I prefer to use my Blackberry when surfing on the go. However, I am looking forward to using the Kindle's 3G when I travel to Spain this summer and seeing how well it does there. As I said above, you can easily change the text size and position on both Nook and Kindle. The major difference between the two is the screen. The Kindle's screen isn't lit, but the Nook Color's is, like your computer's screen, and the light is adjustable. The Kindle, on the other hand, has a soft, paper-like, non-shiny screen and beneath it is actual ink that is digitally re-arranged, sort of like a hi-tech Etch-A-Sketch (thanks to my engineer cousin for putting it in those words!). The contrast can also be adjusted. Obviously there are perks to both...Holly can read in the dark, and I can't. However, Holly did tell me that reading the Nook felt like a constant light in her face, and the Kindle won't dry my eyes out like my computer screen does. Both the Kindle and Nook Color have a music player feature, though the Nook Color's seems to be a little more sophisticated. The Nook can lend books to other readers, which I really like and wish was available in Kindle because I know more people with Kindles than Nooks. 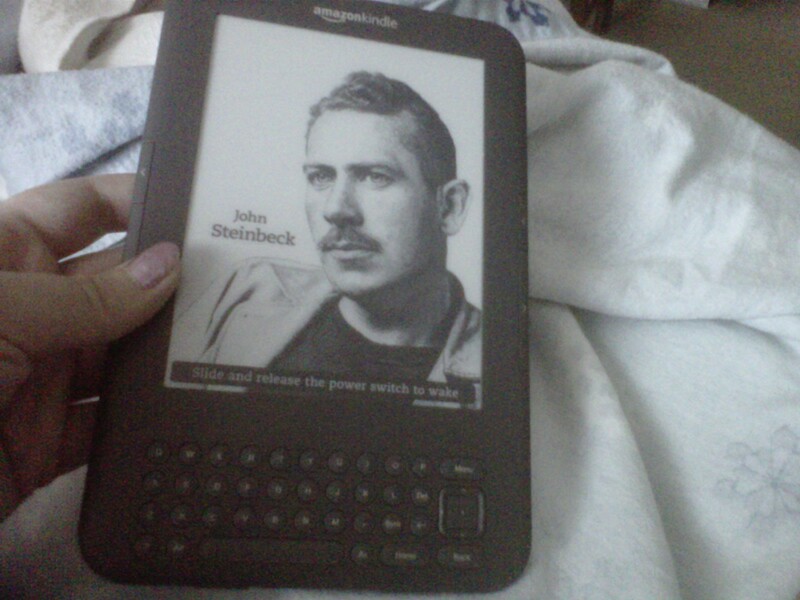 My Kindle turned off, showing John Steinbeck. The Kindle does have an audio to text feature that I have yet to try out, and it comes with the Oxford Dictionary of English and The New Oxford American Dictionary, both of which are connected to a feature that allows you to easily look up any word on the page you are reading in addition to highlighting and making notes. A neat little feature that I love is that because of the actual ink beneath the Kindle screen, when the Kindle is shut off, the ink is left arranged in a picture. There are about 20 different pictures, mostly of famous writers and pieces of artwork, and it's pretty neat. Everyone always thinks I've left it on! Battery life of the two is something I was also curious about By turning off my 3G, I can increase it up to a month. However, I usually keep it on, and after reading 6 books for the total of about 12 or so hours, I've only had to charge the battery once (not counting the initial charge when I first opened it) in the past two weeks. Holly says she charges her Nook every two or three days and uses it every day to access the internet, listen to music, and read. The Kindle Wi-Fi model is $139 , the Kindle 3G + WiFi is $189 , and the Nook Color is $249. I really love my Kindle. It is fabulous, and everything I wanted in an e-reader. The Nook Color is awesome, and it has a lot of neat features, but I feel like it might be distracting for me. I would want to use it to listen to music, surf the internet, etc. For Holly, a musician and a piano performance student who loves to listen to music when she reads and likes looking up music on YouTube as she reads about it, it's perfect. As an English and Lit student who does lots and lots of reading, the Kindle is easier on my eyes and suits my needs better. What it comes down to is knowing what sort of reader you are and what you want in an e-reader and then choosing accordingly. I honestly don't think there is a superior device out there...there are a lot of different options, and it's just going to depend on what you want and how much you are willing to spend. I hope that this post has been enlightening. If you have one of these devices, feel free to weigh in below, or if you have any questions, ask away or shoot me an email at thecompulsivereader@gmail.com! P.S. If you want to try out a Kindle before you buy one, you can now play with the Kindle and Kindle DX at Staples! P.P.S. I do have a friend with a regular Nook that I'd love to get together with to do another comparison piece, and rumor has it that Shanyn of chickloveslit.com just got an iPad, so maybe I can do one with her as well! We can compare/contrast for sure! :) One thing that interests me is battery life - did you guys talk about that at all? Really great review of these two products. I have the Nook 3g and am planning to move to the Kindle soon. The Nook Color is really tempting, but like you, I feel like it might be distracting for me. I really enjoyed the article. I own a Kindle as well! One of the things I love about the kindle although people see it as a disadvantage most of the time is the black & white screen. Because after hours in my laptop is nice to read in something that won't hurt my eyes and the kindle gives the appearance of been a real book! Shanyn: Good point! I did put that in as well! Sarah: The Kindle is amazing, I am so in love with it! I have a Nook Color and so far, so good! I love getting magazines on it. I'm not sure 3G will work in Spain. Is it free in the US? I am unable to buy anything from the B&N store when I am in Germany - though it is just wifi. I love my Kindle and I totally agree that if I had Nook Color I'd probably be surfing the web all the time.. I'm thinking about getting the Nook Color for my hubby because he has a lot of PDF books he would like to upload and they're RPG books so color would be really nice to have. I don't think I'll ever get rid of my Kindle and I got the WiFi only one because I don't think I'll need the 3G network. I can download what I need at home and its ready to go. Also, you can now Lend Books on Kindle.. I think someone started a group for it on goodreads.. It depends on what you want, how much you want to spend, and where you live. I wouldn't mind having a Kindle or a Nook, but since I'm restricted from buying quite a few books from Amazon and B&N won't let me buy any at all (geographical restrictions... ugh!) I went with a totally different e-reader. Geographical restrictions are something that's going to have to be dealt with if any of these companies want to become a global force. It doesn't make sense that I can buy the paperback version of any of these books from B&N or Amazon, but I'm barred from buying the digital versions. Great post! I'm glad you are happy with your choice - and it's nice to get an honest, fair, and practical comparison of the devices! But the ultimate difference: you can't get library books on the Kindle. That was the deal breaker for me and why I went with the Nook (not color). I am an Amazon-junkie so it was a BIG deal for me to opt for the non-Amazon product. But as an almost-done-with-my-MLIS future teen librarian, I just couldn't justify a product that didn't allow me to get free NEW books via my library. I hope others give this thought when selecting their e-reader. Free, new book titles continue to expand at your public libraries but you can't borrow them on a Kindle. Happy reading! La Cocinelle: It is a very personal decision because when you buy, you are committed to buying from a certain company for all of your ebooks. That really stinks for you! Jennifer M: That is a definite con, however, I am confident that it is something that will be fixed. Not five minutes after I posted this I had someone tell me about Kindle's new lending program...so I'm optimistic. This is why it is such a hard choice...there are so many features and so many pros and cons. I gopt a Kindle for Christmas, too, and I love it. I've actually bought e-books from three different companies now and been able to read them on my reader... plus library books and NetGalley books. You can't do that with a Kindle because of their proprietary format. That format is what's going to make library lending on the Kindle really tricky. Unless Amazon comes out with a Kindle device that can read EPUBs (which is what most library books seem to be), they'll probably be left out of the library loop. La Cocinelle: I can access NetGalley books on my Kindle, but not any library books as far as I know. I'm learning a lot from everyone here though, so I may be wrong! I am sad that I can't access Galley Grab, and I hope that changes! WOW! that's a great compare & contrast. i looove mine. e-ink is amazing; lcd sort of fatigues my eyes. plus they lowered the price for holidays. good thing, too- if it was more expensive i probably wouldn't have bought one. I got a Kindle for Christmas, too, and I LOVE it! I'm guessing I've read about twice as many books as I would have in the last two weeks had I not had the Kindle (esp. as I was traveling thus, w/ Kindle, I could just buy another book whenever I finished one). Worried about this new toy putting me in the poorhouse but, otherwise, totally happy! I have an iPad, and I have both the Kindle and Kobo apps. I find that I like the Kobo app better - some of the pros for me are the appearance of a 'real' page turn and I love Reading Life, which is a Kobo thing that tracks your reading stats and awards you when you reach certain milestones. Plus, where I live, some of the Kindle books aren't available so it's good to be able to compare availability and pricing across both of the products. Great post btw, the comparison between the products was very honest and thought-out. I have an Ipad and was an early adopter for the Kindle. Hands down I favor the Kindle for reading. Main reasons: its lightweight, has incredible battery life AND its easy on the eyes, closest to resembling the pages of a book. The Nook may be more of a draw for me if it was able to go color OR black and white. However, two deal breakers for me: No text to speech on nook and no 3G coverage. I use the 3G A LOT - because I travel. This post is so timely. Thank you for taking the time to research and write this up for us. This is sort of a weird question and I'm not sure if you'll be able to answer it, but which e-reader do you think would be better for an elderly person who has zero experience with computers? Mostly I'm curious about navigation and usability. My grandmother is interested in getting an e-reader and she asked me to do some detective work for her. I'm really exited for Christmas. I wasn't really sure which e-reader to get but now I think I'm stuck on the Kindle. This was helpful, though you were missing some things.Thanks!